If you've ever struggled to make a lengthy angled cut, this is the jig for you! With a simple indexed angle setting system, heavy duty hold-down clamps and a smooth sliding design, it makes tapered cuts fast, easy and more precise. Perfect for chair legs, table legs and more. Jig fits snug in any standard 3/8" x 3/4" miter slot and features a large, ergonomic handle for smooth push-action performance throughout the cut. Plus, with the miter bar removed it doubles as a stable straight line ripping jig. The taper guide was easy to setup and cut the desired taper I needed on some small legs. Easy to use to make tapered table legs, saving time & money. I initially purchased a different tapering jig, and when I used it, the saw blade caught my project and kicked it back at me and hit me in the chest. Well, that jig went into the lower shelf of my bench. 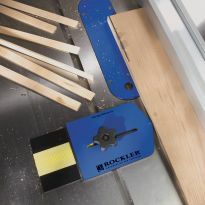 I then purchased this jig by Rockler and you have no idea what a difference it made. No kickback, and made my tapering cut absolutely a dream. I have since regained my confidence to making taper cuts with this jig from Rockler. Setup of this jig was a minimal effort and had it working in a matter of 20 minutes. I have several projects I am designing and they involve tapered legs, and I'm all go for it with this jig. Thanks Rockler. Darned good product. This is a really useful product. I used it to taper cut a short lenght of 3/4" oak flooring and it worked to perfection. 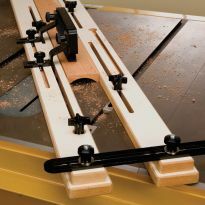 The jig clamps ensure a secure fit to the jig, and the jig itself is very easlt to slide along my Delta table saw. I would recommend this product . It works just as your video shows. It is great. this product saved my project from certain failure. 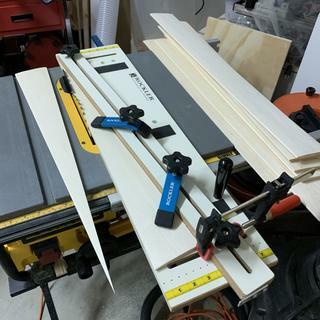 I would certainly recommend this jig to anyone doing like projects. you will need to build a bigger sled to accomodate longer material but for table or chair length, this toy will get you there. 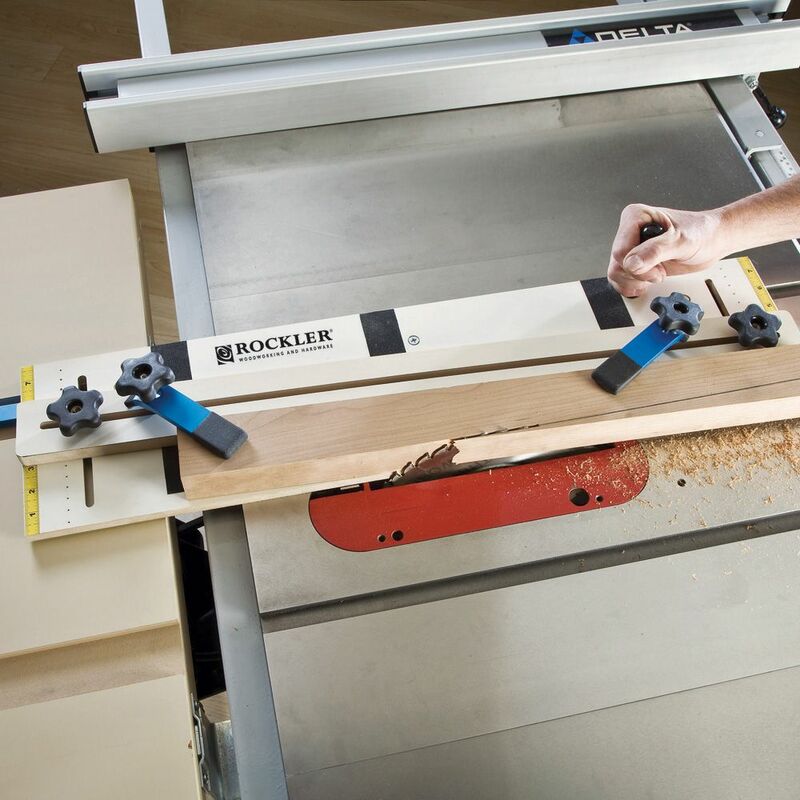 Excellent quality, as we all have learned to expect from Rockler. This is a very handy jig and far more accurate than the one I made and used for projects in the past. I highly recommended. I was hoping there would be an accurate and convenient way to accurately and simply taper a table leg on opposing sides without having to jury rig a spacer to compensate for the removal of material after the first cut. What am I missing? what are your suggestions? I bought this, so I did not have to spend some time building my own jig. I have used Rocker stuff in the past, and have been happy with everything. I should have spent a little more time reading the instructions, since there are 2 different locations for the miter bar. I set it up, and immediately cut through the channels knowing that this was a zero clearance setup. I thought it was odd, but I continued anyway. I will have join the together, and see if I am able to make it work after I ruined it. It is still solid enough to work the way it is, but I do not want to everything sliding off if its not tightened down. All in all the product is great..I was just distracted when doing the initial setup. Delivered quickly, well package, easy to assemble with clear instructions, seems safer than the jigs I had been using. Use to establish known straight edge and to taper. Worked exceedingly well in both functions. This is an excellent jig and well made. I will be getting longer bolts so I can taper thicker stock. I bought this job to help me utilize my Cabinet Table Saw to true up an edge of some Oak boards. It worked perfectly! I was able to glue the boards together and make the top for my new Bookcase Cabinet! The boards I trued up were 74" long! Used to make tapered table legs. Came out great when using it for the first time. Definitely worth having. This is a great addition to any table saw. Very nice jig. Easy to assemble and use. It makes a tricky job that requires accuracy very easy. I will do more projects with confidence. It took a little practice to work with this model given my pieces are smaller. But I have to say, I am getting consistent cuts and feel a safety no other design provides. Very pleased. Nice jig easy to use ! I put off buying this jig for a while but should not have. Now that I have it, use it a lot for cutting angle legs or to just straighten the edge on a board that I would have thrown away before. Needed such a jig, but didn't want to take the time to build one. Used it to get a straight edge on irregular board. Don't have a jointer. Very simple to use and accurate. It’s light weight and easy to store. Great product. Just was I was looking for. Useful jig for semicircular shutter. 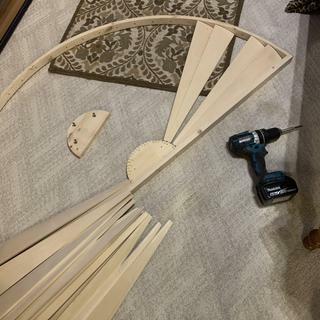 I had made shutter blades for a small semicircular transom using my own jig, but the blades for my newest project were much longer at more than 2 feet. I thought I’d give this jig a try. It worked great for these blades, I was able to make 4 per 58” shutter stock. Worked really well easy to use. Created accurate tapered legs. I still consider myself a beginner and sometimes it's just easier to buy a pre-made jig. Rockler "nailed it" again! I just received my straight edge jig. I used it to make tapered legs. It was very easy to use and every leg came out perfect. It is not quite finished but you can see the tapered legs. Just what I was looking for. Works just as described. I needed to taper some crib legs and some table legs. This was easy to use and worked well. Glad I got it. It ddoed what I expected it to do. Worked well. I purchased this jig on the recommendation of a friend who spoke highly of it. I had previously attempted to taper a table leg using a home-made jig (design taken from YouTube) and inadvertently lost the piece and nearly ripped off my thumb in the process. Even with my hand in a cast, I was able to finish my tapering project SAFELY and effectively with the Rockler jig. This was a must have for my shop. Not only good for putting a taper on legs but also great for putting a straight edge also. This unit is slick. Love it. Sure beats the jig that I made. Ease of used. And improved safety. I have a lot of reclaimed cedar fencing to build an accent wall. Need to square some edges. Very excited to try this out! I make stars with unusual amounts of points and this will be very helpful. 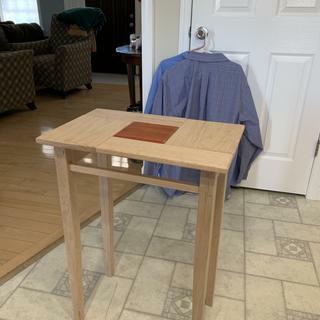 Use for table legs. I have confidence in the quality of all Rocker products, as a result of purchasing numerous items over the pass several years. For a piece of furniture I am going to build. At this price it makes sense to buy versus build as I can spend my time on other projects. Hoping it will help with those specific types of cuts. Starting a project that will require numerous tapers of varying sizes. Looks like a fair price for creating straight line boards until I invest into a plainer. Making pallet wood furniture and need the ability to straighten the "raw" wood for proper jointing. Was Less expensive then building one myself. Too lazy to make my own and the price seemed more reasonable (on sale) than the regular price. I needed a Way to cut tapered legs and design pieces correctly and accurately Every Time. I don't think you could make a better Jig! Needed a jig to make several angled cuts for a couple of coffee tables for a silent auction supporting missionary's. I need it for a project and the price was right. I needed for an upcoming project. Seems to be for want I am looking. Been wanting one for a long time. Price was right today. This is the safest solution I have seen to a dangerous task at the table saw, bar none! I needed a jig like this for an upcoming project.. I could make one but that takes time/money I could better spend on projects.. Besides, mine would not exceed Rockler accuracy. Bonus! On sale..
Amazing tool for the price! To do tapered legs and to help get a straight edge on not-so straight lumber. Son wanted for his birthday to add to his wood shop. Appeared to be a quality product. needed to make tapered legs for a bench. I cant build it to this quality for this price. I chose this jig because of the safety features and reviews. It is difficult to cut tapers so I hope this will do the job. I needed to cut angles safely on my table saw. I have a ridgid contractors saw, 22" front to back and only about 9" to the blade. I don't know if I can make this work. Anybody have a similar size saw with this jig ? What is the maximum length that you can taper with the jig? After having tapered many boards in my life, including some pretty tall bedposts, it's my humble opinion only that I wouldn't try to SAFELY taper or straight line anything over 8" either end of the jig. In my opinion that would be pushing it. I would be be building a special jig any other purpose or using a straight-line board. It's always wise when working with woodworking machines, to be patient, take your time and not try to take short cuts. After 50+ yrs around them, knock on wood, I still have all my fingers and toes...Keep in the moment, relax, enjoy and do what you NEED to do to accomplish what you need to accomplish. Does this jig work with DeWalt job site saws? BEST ANSWER: The miter bar on this product is 3/4" wide by 3/8" thick. I am not sure what size miter slot the DeWalt has. This item also has to be run through your saw which will cut some of the platform away. 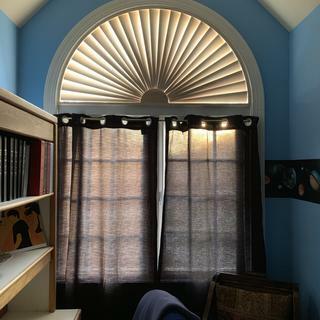 The second problem might be the distance from the blade to the miter slot. The taper jig offers two locations for the miter bar. One is 1-15/16" from the edge and the other is 3-3/16" from the edge. As long as the cut doesn't get close to the adjusting slots on the platform it should work. I have the "DeWalt 15 Amp 10 in. Compact Job Site Table Saw" and I used this jig with it. The miter bar fits perfectly and it only had to shave off a very small amount of material when doing the initial cut for zero clearance. Has anyone used this tapering jig with a Bosch Model 4100-09 table saw? BEST ANSWER: Used it for the first time and very satisfied with the results. Will this fit a Dewalt 7480? Can you do compound angles with this jig? 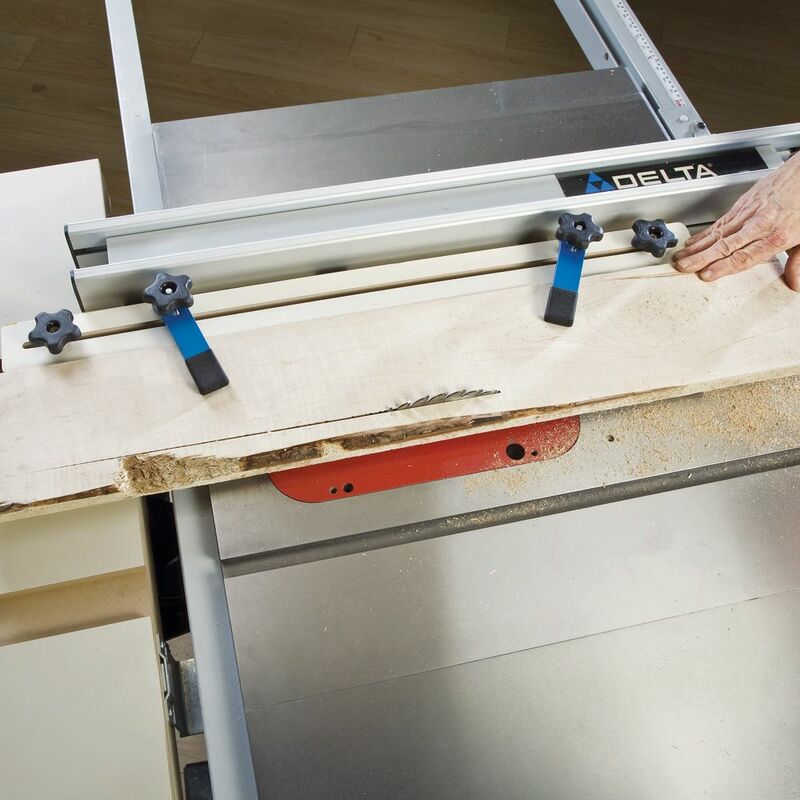 BEST ANSWER: The jig holds the stock flat or parallel with the surface of the table saw, so by tilting the angle of the blade in the table saw, a compound cut could be achieved. 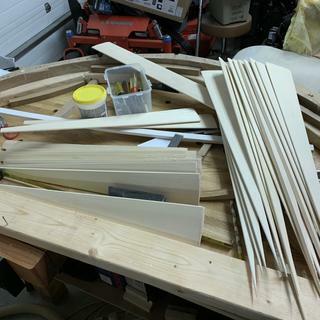 Be aware that the sled does not accommodate large angles, probably about 20 degrees or less and the jig does not handle stock thicker than about 2 1/2". This will limit the compound angles that can be cut with it. I have not used it for compound angles but I do not see why it wouldn't work well for that as long as you have the blade clearance from the jig. Will this fit a 10" Craftsman Table Saw? 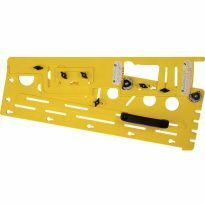 BEST ANSWER: Hi, this item is not specific to any make of table saw, it's the recessed guides. While I can not speak for a Craftsman table saw, I haven't seen a saw that did NOT have the recessed guides. With that said I don't think there would be a problem with your application of this jig. I have an old Makita portable saw and it works great. I don't have any friends with a Craftsman and our Sears just closed so I can't check that. The jig fits any normal miter slot and is then trimmed to exact fit. 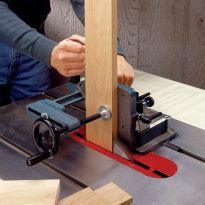 Use it on a older craftsman table saw but it was a cut you may not be able to cut wide material with it. I have a 3HP, 10in Craftsman table saw with cast iron extensions, and the cross cut sled does fit my saw. Yes. You have to cut the edge of the jig to align it perfectly with the saw blade. 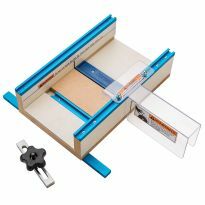 Anybody use this jig with the Bosch 1031 worksite table saw? The saw is nice but small. BEST ANSWER: There is no reason not to be squared to your blade. Remember that after you install the sled to the bar, you have to make one pass through the saw to cut excess and that is your straight edge. I have this saw, this jig will only work if you have so kind out feed table. Will this do 18 degree cuts? when taper cut one side how do you do the other side to match? 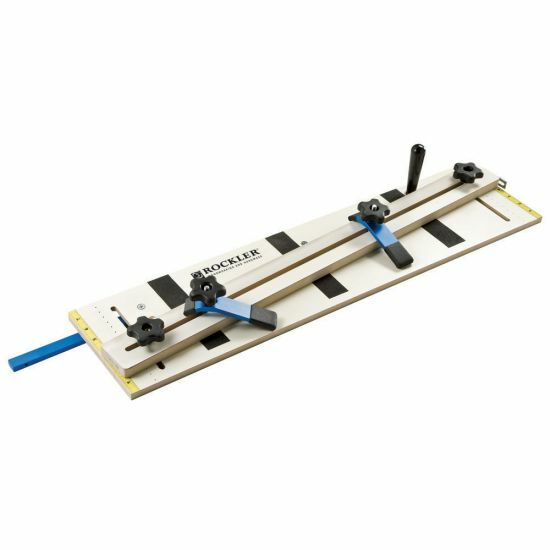 Can this jig be used with a Delta 10" Portable Table Saw? BEST ANSWER: Yes, it would work, I am using on a stationary Jet 10" saw and did have on a Dewalt 10" portable saw. Yes. I have a Delta 10" contractor's saw and it works great. How thick of stock can you put into the jig; for example for say 2 or 3" thick tapered legs? BEST ANSWER: 2" is about as thick as you can go. I put some 2" stock through and it about maxed out the clamp width. It really depends on the blade size in your table saw. 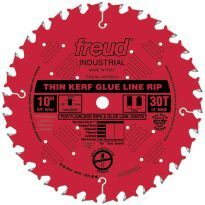 The jig is about 1/2" thick, so raise your saw blade as high as it goes and measure the height of cut you can make and subtract half an inch and you have the max thickness you can cut with the jig. Sorry, lost this email. You are right. Uses Rockler standard hold downs and I checked and hard to clamp down a piece of wood much more than 1 1/2" thick. Sorry for the delay, I imagine this info isn't really pertinent anymore. With the jig in place, raise your blade to full height and measure how much space you have left to the top of the blade. May do 2", but doubt it will accommodate 3". THe knobs for securing the piece in place can handle 3" stock and maybe a bit bigger. If you need to just change the lenghs of the knob screws. The work piece is 1/2" off the table, is there a problem with tear out? BEST ANSWER: Absolutely not, because you are using the edge of the sled as your guide. Just like a zero clearance insert. You are mistaken. In two of the three applications shown in the demo video the guide is removed, the jig is butted up to the fence and the workpiece is well off of the edge of the jig: a full have an inch into "the air". I used the jig to cut tapers on 2" solid oak table legs. I did not have any issues with the quality of the cut but obviously you have to be very careful on placing the pieces the same in the jig or the tapers do not come out the same. I would suspect, especially with sheet goods, that tear out could be an issue. That is an advantage because you don't have the piece your sawing dragging on the saw table and it allows the saw dust to clear away. How long of a piece can you taper with this jig? BEST ANSWER: I have used my jig a few times and it works well. The board is 32 " long and the miter bar is 36". You are primarily limited by the length between the edge of your table and your blade to slide the jig for the cut. I would say you can comfortably make a 32 ' cut and may be able to go up to 36". Hope that helps. Should be adequate for most table legs since you don't normally taper the whole leg. I've only used it to straighten relatively short pieces, but the length is limited by your table saw, not the jig since it rides in the mitre grooves. With my saw, probably around 32" would be the limit. What is the configuration of the miter bar? "T" type or rectangular? measurements of it's cross-section? BEST ANSWER: The miter bar is must a aluminum bar measuring 3/4" x 1/2". It just slides in your miter slots when making the cut. Although, on my table saw, Delta, I am unable to use the miter bar, so I simply set the fence the distance I need to put the edge of the jig against the blade and that is my zero clearance. Works well. I've not had a problem as yet. Rectangular. Slightly less than 3/4". Will this work for a 42" stair tread? I need to make a taper cut the full length of the tread. BEST ANSWER: The length is doable depending on the length of the runout table. Mine is 20". The challenge is the width. Depending on the miter angle the stair tred is going to hang out beyond the taper jig base too far to be stable. My fix is to take a strip of 1/2 "MDF, plane it to 7/16 and clamp it to the saw table on the opposite side of the saw blade to give the offset stability. It'll work. Will this hold a 4x4 ? The two locations for the miter bar to be attached leaves the blade 3/8 inch from the jig or overlaps the blade too much. If I cut for zero clearance, the cut is too close to the adjustment slots. I can either use with a 3/8 inch gap to the blade or drill additional holes for the miter bar. Any experience with this problem and which is the best alternative? BEST ANSWER: I returned mine for the same reason, and built one following plans I found on the web. I did use miter bars, track bars, and knobs that I got from Rockler. I read in the reviews several people saying that the jig sets off the Sawstop brakes. I have a Sawstop. Is this true, and what can be done to avoid it, other than turning off the brake on the saw? BEST ANSWER: I think if you set the stick on measuring tapes off the zero clearance edge it shouldn't be a problem. The metal tapes would definitely set the sawstop off. But, those tapes are stuck on and could be set 1/16-1/8" in from the cut edge and you'd be fine. I have a Ryobi table saw which only has miter slots on left. Can this jig be modified to work on that side? If not, why? BEST ANSWER: I bought this jig and now use it on my Ryobi table saw. I use it from my slot on the left. It worked well for my table project. Good luck! Miter saw track too long for out feed table slot. Anyone cut the track? BEST ANSWER: I had this problem with my Incra miter jig.I extended the slot in the outfeed table. Will this jig work on my Bosch GTS1031? I just used the tapering jig for the first time, but I found when I tightened the clamps on the adjustable fence, the fence raises up and bows on one side of the slot as the head of the t-bolt underneath pulls to one side raising one side of the fence, almost coming up out of the slot. It's as though the bolt isn't resting securely in the channel. Any ideas of how to fix that? Can this be used for cutting angled back chair legs? The overall length of the leg is 36”, the bottom 18” is 90 degrees to the floor and the top 18” is tapered 12 degrees. Used the band saw freehand the first time around but thought this could be more precise.